A long down-stay is one of the behaviors that many dogs struggle with when they enter Advanced Training. Yet this seemingly simple behavior is extremely important for working service dogs. Their partners will use this behavior all the time. 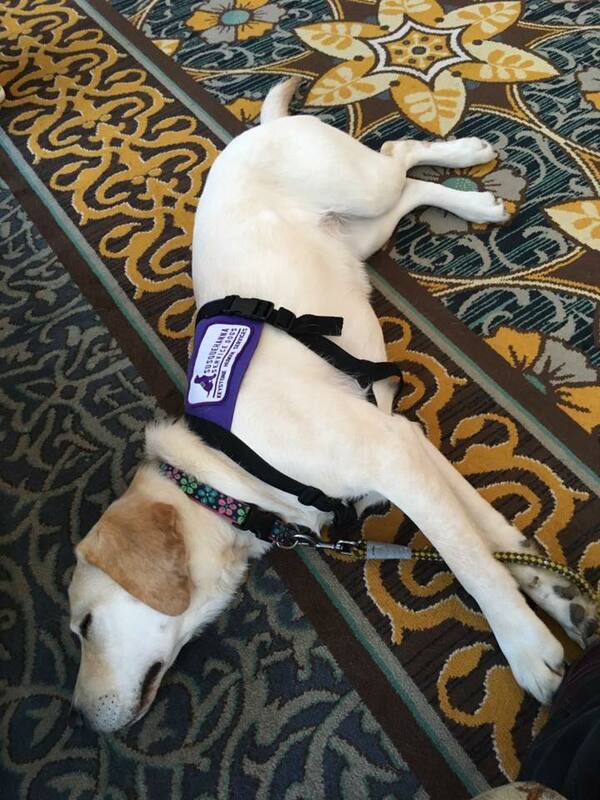 A long down-stay is one of the behaviors that helps a service dog become invisible in public. When they go to a restaurant, the dog will be in a long down-stay under the table. Movie theater? Long down-stay. Office or school? Long down-stay. Airplane or public transportation? Long down-stay. As you can see, a dog cannot be placed as a service dog until they have mastered this behavior. 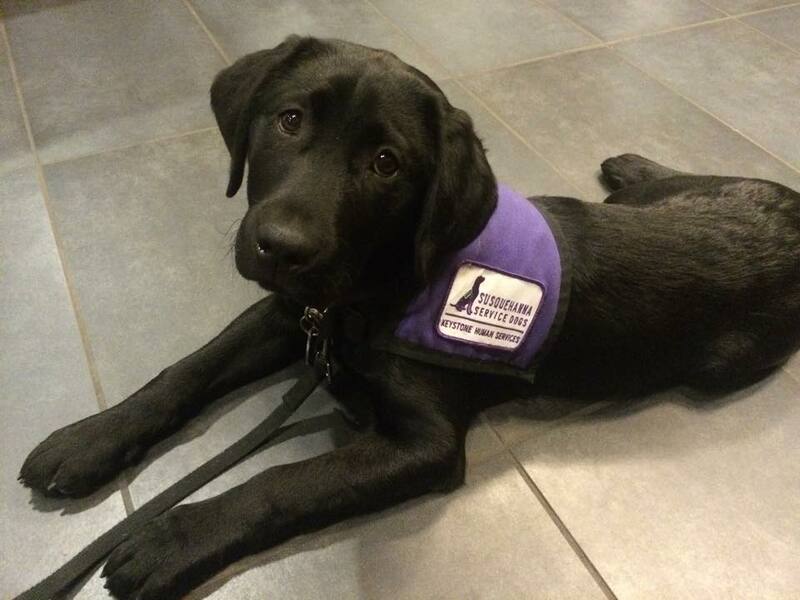 Service dogs must be able to hold a quiet down-stay for a long time, without needing to be re-cued and without barking or whining. How do you train it? The key to training a long down-stay is to never treat the dog during the stay. 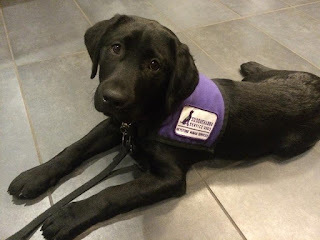 When puppies are very young, you can cue them to “down,” give them a treat (but no click), and then cue them to “stay.” Then they don’t get another treat until you let them know the behavior is over by clicking and treating. For older puppies, you should simply cue them to “down” and “stay” without giving them a treat. They get the treat at the end of the behavior, when the down-stay is over. Only then do you click and treat. If the dog stands up before you let them know the down-stay was over, you can re-cue them to “down” and “stay.” But don’t give them a treat! It’s extremely important that you do NOT give them a treat when they lie back down. Why? If you treat them to lie back down, the puppy learns that when they stand up, they’ll be given something to do and get another treat. And since these are smart dogs, they’ll just keep standing up so they can get another treat for lying back down. If a dog knows that they’ll only get a treat at the end of the long down-stay, they’ll learn to settle much better. The ideal long down-stay results in the puppy completely relaxing with their head down. Where and when should you practice? A great place to start teaching your puppy is in your own home! You can start at the kitchen table. Put them on a leash during dinner and cue them to “down” and “stay.” That way, if they bark or whine, they won’t interrupt anyone but you. Plus, you won’t be tempted to treat them to make them be quiet. Once your puppy can handle a long down-stay at your kitchen table (or anywhere in your house), you can try other places. Please remember, though, that the length of your dog’s down-stay will depend on their age. A 10-week-old puppy may not be able to do a 30 minute down-stay (unless they’re sleeping). With consistent practice, your dog will be able to settle into a relaxed, long down-stay and become practically invisible when they’re out in public.